This week I was discussing an assessment test with one of my colleagues at Stanford. A test that predicts how long you will live. It is a simple sitting test. As I have shared many times in my blog and classes, flexibility, balance and muscle strength are key indicators of longevity and quality of life. It’s no secret I LOVE to run, but I am a better happier healthier runner because of the exercises and workouts I do and share in my boot camp and classes. If you try this test and don’t do well, don’t be discouraged. 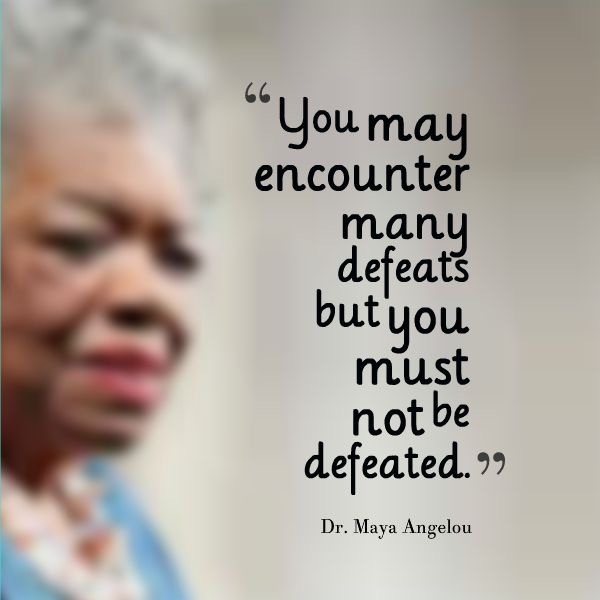 Never stop believing you can feel better and get stronger! No time for exercise? Too busy to eat right? What kind of a toll is it all taking on your health? There’s a simple test you can do just about anywhere that’s been proven to predict how long you’ll live. 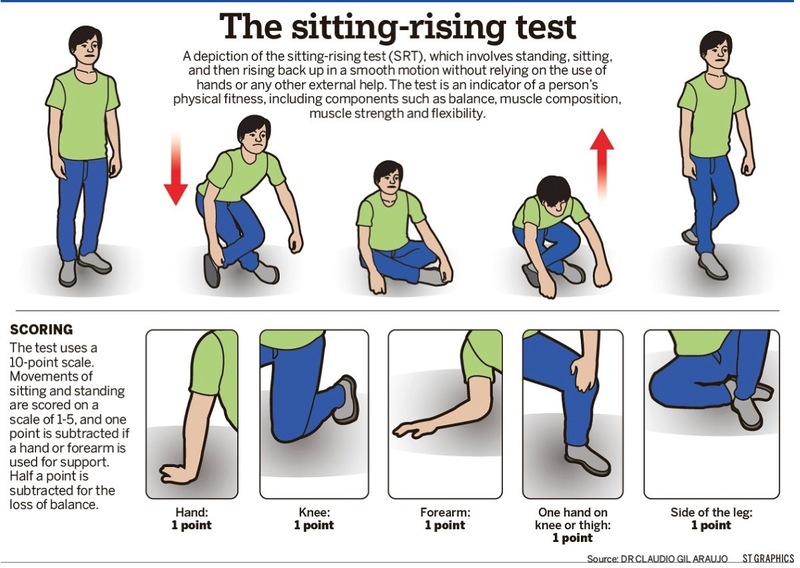 A doctor in Brazil invented the Sitting Rising Test or SRT, and he’s proven it can predict your risk of dying in the next five years. When it comes to figuring out how healthy you are, and long you might live, a cardiac stress test is often considered the gold-standard for giving doctors very specific information. “What we’re doing from a stress test standpoint is what we call risk stratifying somebody for their risk for a heart attack, and dying from a heart attack in the next one, three, or five years,” says Dr. Michael Lim, director of the Division of Cardiology at Saint Louis University Hospital. But what if you could predict your longevity quickly, easily and without even leaving your home? Scientific studies over the past 15 years have proven if you have trouble getting down and getting back off the floor, it’s nothing to laugh at. Dr. Claudio Gil Araujo, MD, PhD, a specialist in exercise and sports medicine, also works with cardiac patients at Clínica de Medicina do Exercício – Clinimex, in Rio de Janeiro Brazil, and invented SRT to easily measure non-aerobic physical fitness. In an interview via Skype from his home in Rio, he said the idea for SRT came from observing his older, sedentary patients who could pass basic aerobic tests. The goal is to get down and back up from a sitting position with minimal support. It can be used in all age groups, and results are based on a scale of one to 10. Score three or less and your risk of dying is five times greater over the next five years. It may look and sound easy, but here’s how it’s done. You cross your feet, and go into a seated position. That’s five points. Coming back up is another 5. But you can lose points really fast. Total them all for your final score. If you have bad knees or hips, don’t try this alone. “Have a friend, have a spouse, have a friend with us when we do this,” said Dr. Lim. But for every point you get, there’s a 21% decrease in mortality from all causes. Dr. Lim, says it makes sense. “The more active we are the better we can accommodate stressors the more likely we are to handle something bad that happens down the road,” said Dr. Lim. Dr. Araujo’s data has been published in American and European medical journals. By the way, he says if you’re over 50 and score a perfect 10, you should be proud, because not many people in the age group can do it. Our Challenge for this week! Do you REALLY know how much sugar is in the soda and juices that you are drinking? It’s CRAZY how many calories you can actually consume in such a short period of time when you have a drink. 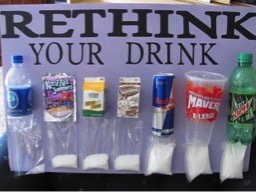 Did you know that sugary soft drinks are the #1 source of calories in the average American Diet!?!? One Soda a day can increase your risk of a heart attack EVEN if you are not gaining weight? 56% of 8-year-olds down soft drinks daily, & 1/3 of teenage boys drink at LEAST 3 cans of soda per day! Needless to say, soda is one of the leading contributors to the explosion in our rates of obesity, diabetes, heart disease, and a whole host of other problems. So…. if you are a soda drinker, your challenge of the week is NO SODA!! Not only are there ZERO nutritional benefits in these sugary drinks, but they are absolutely harmful to your health. If you need the caffeine buzz (especially because it’s Monday) go with Green Tea (has anti-oxidants) or Un-sweetened Tea. Or…..coffee. If you HAVE to sweeten it, find some coconut sugar. It’s got a low glycemic load (won’t raise your blood sugar too much) and it tastes great. Are you Up for this challenge this week? I have been kind of obsessed with the Sumo Orange this winter. This is a good picture. They are actually kind of scary looking. But they are in season, delicious and probably the sweetest citrus you can eat! 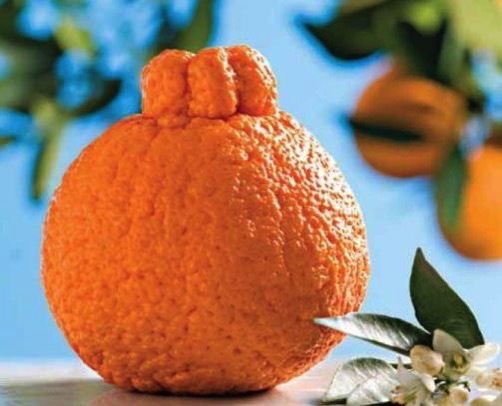 The Sumo Orange is grown in the California Central Valley and combines the best of the easy-to-peel Japanese Satsuma with the big, juicy, sweet oranges from California. Yum!